Stray dogs are a sadly familiar sight in Greece. It's something that shocks many first time visitors. 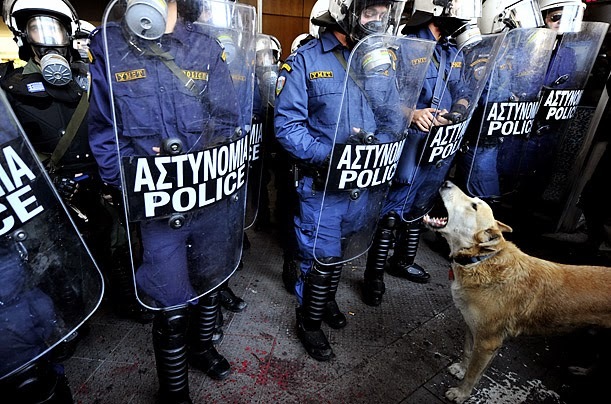 You see them curled up in shop doorways, playing with the owned dogs in the parks, sleeping on traffic islands or by the side of the road, wandering the high streets, even joining protests in Athens (like the famous dog Loukanikos 'Sausage' http://ti.me/1eYJ1Gd)! The strays I've seen in Greece are almost always very docile, quite afraid of people, quiet and just trying to survive. And most of the people I know in Greece are very good about putting out food and water for the strays in their neighbourhoods, taking strays to animal welfare centres to be looked after, and adopting strays. However, there has recently been an increase in the number of dogs abandoned by owners affected by the economic crisis and no longer able to support their dogs. The results of this were all too clear when I visited Crete last summer after a few months away. I felt really nervous walking with my dog in some areas of Heraklion, due to the newly formed packs of stray dogs. I had seen small packs of strays in the past, for example up on the Venetian walls of the city in the early mornings, but I hadn't seen packs like this before. They were also more territorial and aggressive. One such pack had made the area around the graveyard at Agios Constantinos (Heraklion) their home. One evening they were approaching us and barking so ferociously that we turned back, almost running, and returned home via a much longer route. My friend had a similar experience in this area when passing through with his dog. I don't know what these dogs would do if we continued through their territory, probably nothing, but it is quite a scary sight. None of this is new, but I think the rapid increase in the numbers of abandoned dogs can be alarming when you are out and about with your dog. I may have missed some organisations (my apologies, you are all doing fantastic work! ), but you should be able to find a shelter or group in each area of Crete from the websites listed above.